Recently, Dr. Xu Zenglai, the professor from Nanjing Botanical Garden Mem. Sun Yat-Sen, will work in Qinling National Botanical Garden as the curator of its herbarium for three months. All from CUBG Talent Exchange Plan for Members talked about. Last year, CUBG launched this plan in a bid to promote members’ exchange and cooperation in talents then improve the overall standards around China. In a manner of staff-sending and introducing needed personnel, Qinling National Botanical Garden, a newly-developing botanical garden, summited their crying need for a curator of herbarium. It took CUBG a holistic view and finally checked with Nanjing Botanical Garden Mem. Sun Yat-Sen. They took it very seriously and recruited internally. Finally, Dr. Xu Zenglai, the deputy director of its herbarium, was chosen to support the construction of Qinling National Botanical Garden. Dr. Zhou Yifeng, director of Personnel and Education Division, Nanjing Botanical Garden Mem. Sun Yat-Sen, introduced the basic information of Dr. Xu, when they two sides met on 4th July. 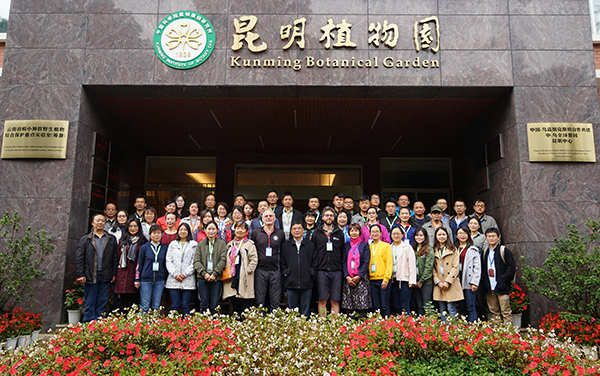 “We really appreciate the great support from CUBG and Nanjing Botanical Garden Mem. Sun Yat-Sen.” Prof. Zhang Qinling and Prof. Cui Xun, director and deputy director of Qinling National Botanical Garden, expressed their gratitude and demanded their staffs coordinate to assist Dr. Xu.